This year's ride to pool day was another fun event! I'm so pleased that the weather held and the forecast showers didn't eventuate, especially since bad weather put a stop to the first planned Ride to Pool Day. Isn't it great that we've had our pool back for two season's? It certainly hasn't been quite as hot this year, but the Coburg Olympic Pool has still been great fun and is a fantastic place to meet and relax with friends. Last Sunday the learn to swim pool was action packed and there were kids queuing to have a go on the jumping castle. 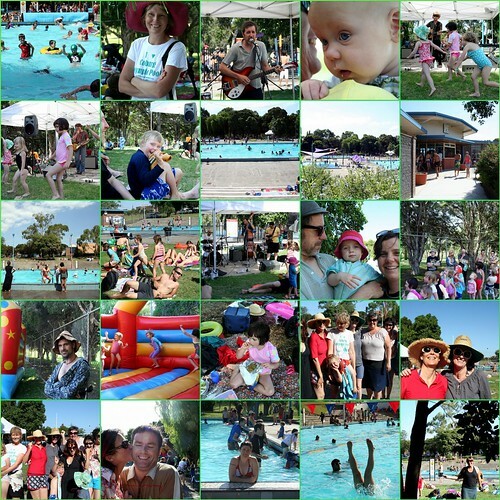 There was music and dancing, water and sunshine, lots of relaxing under the big shady trees and an all round good vibe. I just love our pool. It's so, so good to have it back. Ride to Pool day, take two! Hopefully the weather this Sunday will be fine. 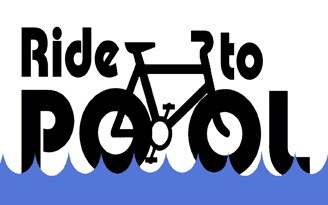 Ride to Pool day at the Coburg Olympic Pool has been rescheduled for 21/02/2010. This was a spectacular day last year and promises to be again, with music and dancing, swimming fun on the pool inflatable and in the jumping castle. Friends of the Coburg Olympic Pool will be selling some t-shirts and there will be a sausage sizzle from the High School for Coburg Group.